This SPF 30 primer has an oil-free formulation, a silky matte finish and a cocktail of anti-oxidant vitamins to prime and protect the skin pre-makeup. A 100% natural mineral UV barrier provides broad spectrum UVA/UVB protection that is low irritant and suitable for sensitive skin. 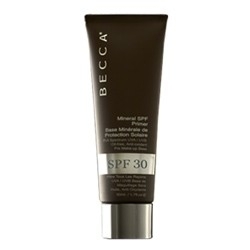 BECCA's Mineral SPF Primer is ideal for use under make-up everyday or at the beach or when playing sports and has been developed using Australian Sunscreen technology. 100% mineral active ingredient (micronised Zinc Oxide). Helps make-up adhere to the skin and last all day. Allows make-up to become water-resistant. Inactive Ingredients: Aqua (Water - purified), Cyclomethicone, Caprylic/Capric Triglyceride, Glyceryl Distearate, Ceteareth-20 (Cetomacrogol 1000), PEG-30 Dipolyhydroxystearate, Phenoxyethanol, Methylparaben (Methyl Hydroxybenzoate), Tocopheryl acetate (D-Alpha-Tocopheryl Acetate), Parfum (Fragrance), Carbomer (Carbomer 940), Camellia Sinensis Extract (Camellia Sinensis Leaf Extract), Oenothera Biennis Oil (Evening Primrose Oil), Sodium Hyaluronate, Propylparaben (Propyl Hydroxybenzoate), Ubiquinone 10 (Ubidecarenone).